Looking for the 2010 post? 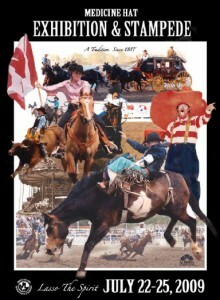 With the 2009 Medicine Hat Stampede & Exhibition well under-way, many are excited for this weekend when they will get the chance to visit the Exhibition portion of the event. The grounds officially opened today at noon. The festivities began with a pancake breakfast served at the Medicine Hat Lodge from 7AM to 10AM this morning where an estimated 2,500 people attended. There’s also another breakfast coming up on Friday if you missed this one – make sure you get the details in the guide supplied below. Already concluded in this years festivities was the Stampede Queen Contest, won this year by Candice Wutch followed up by Stacey Kading (crowned princess), and Cymara Shock. The event was on Saturday, July 18th and you can check out the Medicine Hat News video on the event here. Another one already finished is the annual Visual Arts Show which I sadly didn’t enter this year due to time. Dusty didn’t enter this year either; however, she won 1st place last year. I’ll post the results of that event here when I find them out. Most of the works should still be up though for viewing in the Cypress Centre – don’t quote me on that though. There’s really too many events and things going on to talk about here though. If you want anymore information, please be sure to check out the official website, or grab yourself a PDF copy of the Stampede Event Guide 2009. Careful with the PDF. There’s some huge complex artwork included in it that brought my computer to a slowed halt. *Update* Alternatively, you may view Medicine Hat Media’s compressed computer-safe version here.